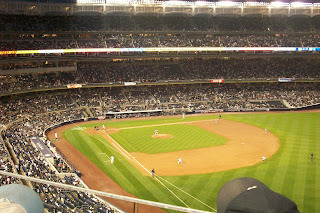 Mike and I went to see the Bronx Bombers in action last Thursday at their brand-spanking-new stadium. 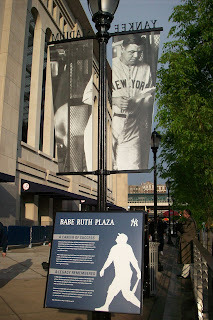 I have never been to a baseball game, although I've always wanted to go because I've heard how fun it is. 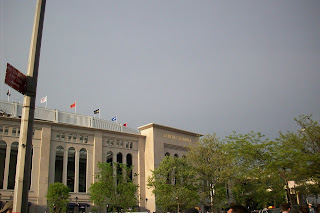 The experience began on the train ride into the city, where the cars were filled with fans dressed in their team colors. 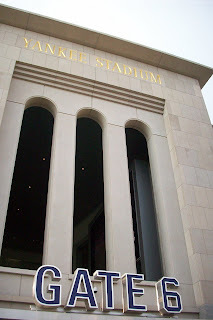 Every now and then, someone would yell out "Go Yankees!" or "Go Mets!". 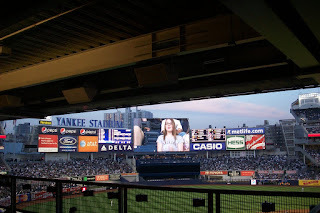 The new Yankee Stadium is big and beautiful, and even has eco-friendly features like composting bins, natural cooling around the concession areas, biodegradable and recyclable paper products, water-saving toilets and waterless soap, hands free faucets in the restrooms. The energy is high, mostly positive. Always funny listening to the fans commenting and reacting during the game. 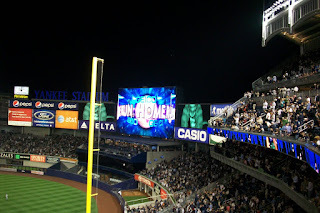 The 6000 ft. HD video screen after one of Johnny Damon's 2 home runs. There's Jumbotron views of the audience, games and prizes in between innings and between each team's batting and fielding. Even though the Yankees lost the night we watched, I had a wonderful time. Take me out to the ballgame anytime.